President Buhari summons Oyo-Ita, Kyari over heated argument at the FEC – Royal Times of Nigeria. 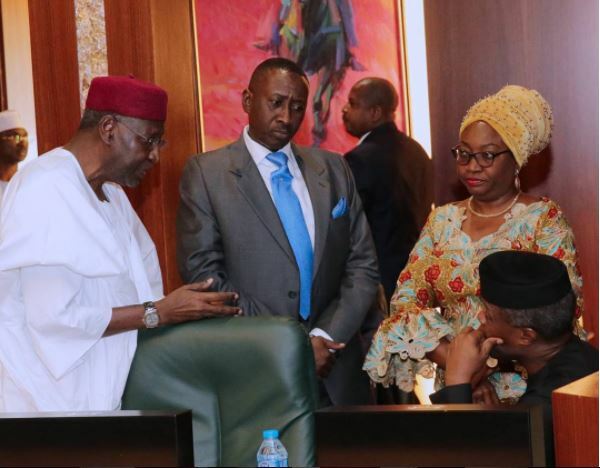 President Muhammadu Buhari on Wednesday summoned the Chief of Staff, Abba Kyari, and the Head of the Civil Service of the Federation, Winifred Oyo-Ita, over their clash at the Council Chambers of the Presidential Villa, Abuja. The heated argument between Kyari and Oyo-Ita, which occurred shortly before the Federal Executive Council (FEC) meeting, was believed to have been caused by the leaked memo, which Oyo-Ita sent to Kyari on the controversial reinstatement and posting of the embattled former chairman of the Pension Reforms Commission, Abdulrasheed Maina. A source privy to information at the meeting said Kyari accused Oyo-Ita of leaking the memo, which she wrote to the CoS on the reinstatement of Abdulrasheed Maina into the Civil Service.